Arundo tibialis Roxb. ex Wall. A wed site of native Indian plants, plus cultivated and naturalized species. It has good quality photos and terse details on more than 3,000 species and cultivars. 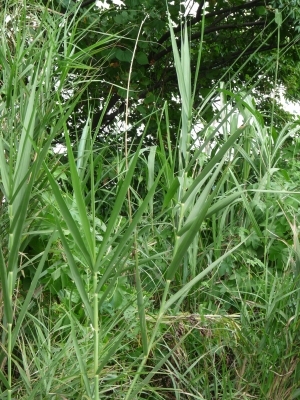 The plant has a wide range of local uses, mainly as a source of materials but also for food. It can be planted by rivers as a means of protecting the soil from erosion and can also be planted in beds in order to purify water. Widely spread through tropical Africa, tropical and subtropical Asia to New Guinea, Australia and the Pacific. An online resource giving botanical information, and a little bit about plant usage, for over 2,700 species of plants found in the Australian rainforest. Terse information on over 650 species of plants that grow in grassland, including trees, shrubs and perennial plants as well as grasses. Gives a brief description of the plant, its range and habitat and some of its uses. A very comprehensive, if rather dated, guide to the plants of Guam. It can be downloaded from the Internet. Moore P.H. & McMakin P.
Brief details, usually with a photo, of plants native to the island of Guam, often together with some information on their uses. An online version is available. A useful guide to some of the plants of the area, though terse on details. The book is out of copyright and can be legally downloaded from the Internet. Seed - surface sow in a light position. Keep the soil moist by emmersing the pot in 3cm of water. Germination usually takes place quite quickly. Prick out the seedlings into individual pots when they are large enough to handle and plant them out when large enough. Division at any time, but especially when the plant is coming into new growth. Very simple, any part of the root that has a growth bud will grow into a new plant. Larger divisions can be planted out direct into their permanent positions.